Nice enjoys extraordinary natural conditions. At the point where the Alps meet the Mediterranean Sea, protected by the mountains and with the sea and the sun before it, the place has a splendid natural location. Originally a Greek colony (Nicaea), the area has always been inhabited and, from the mid-19th century onwards, it has been a favourite place for tourism and an example of excellent habitable land. Capital of the Côte d’Azur, well connected with the rest of the world by airport (France’s second busiest in the summer) and train, in addition to its tourist industry, the city of Nice is also an international economic centre. 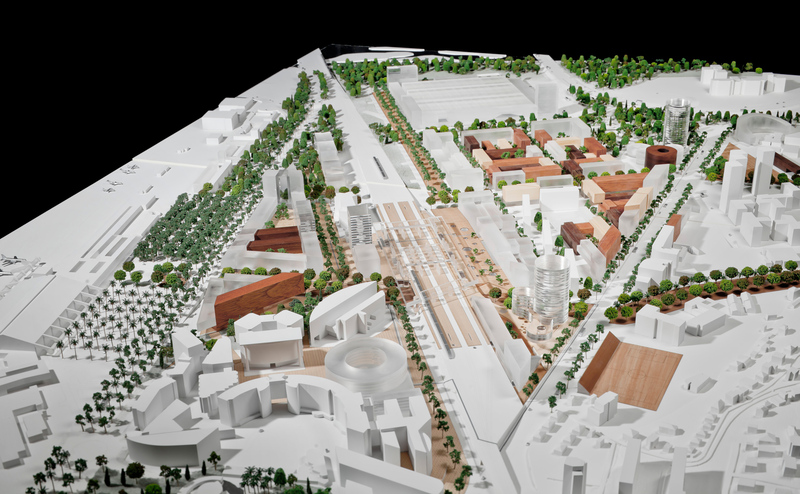 In this context, we have 50 hectares of public land on which to design the city’s new urban centre. 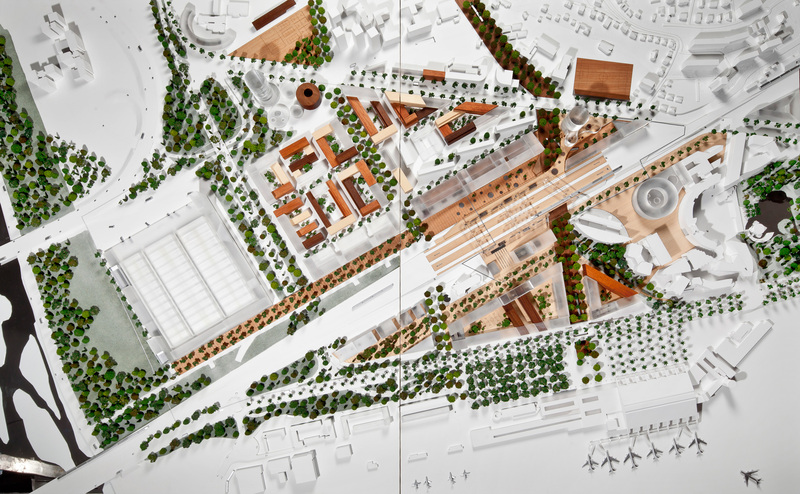 Located adjacent to the airport and the sea, crossed by the railway line with its planned TGV station, the place is a multimodal hub (airport, train, tram, bus station). 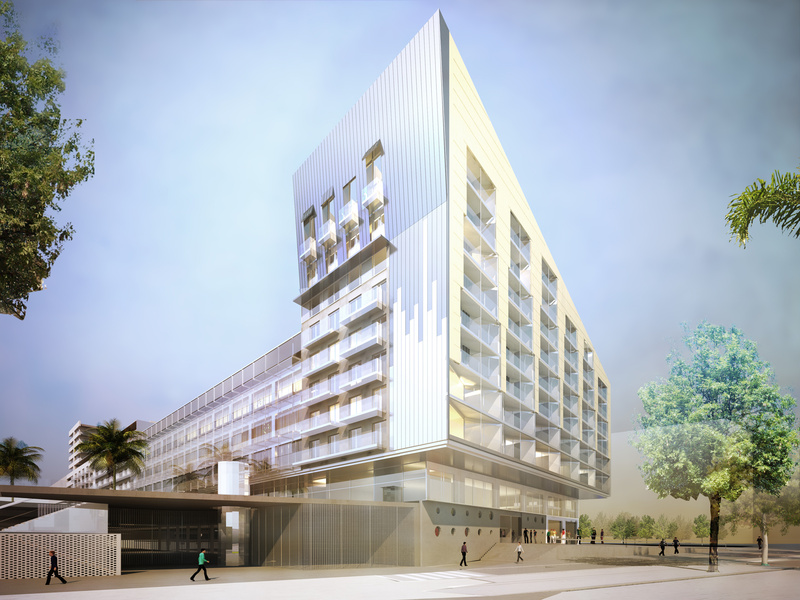 In the 900,000 m2 of planned building, we have to arrange buildings and public spaces to accommodate contemporary production and residential uses. The general structure of the territory is based on a Cartesian coordinate system: the ordinates, running north-south between the mountains and the sea, are channels of road traffic and drainage (Pompidou, Maicon, Axe). 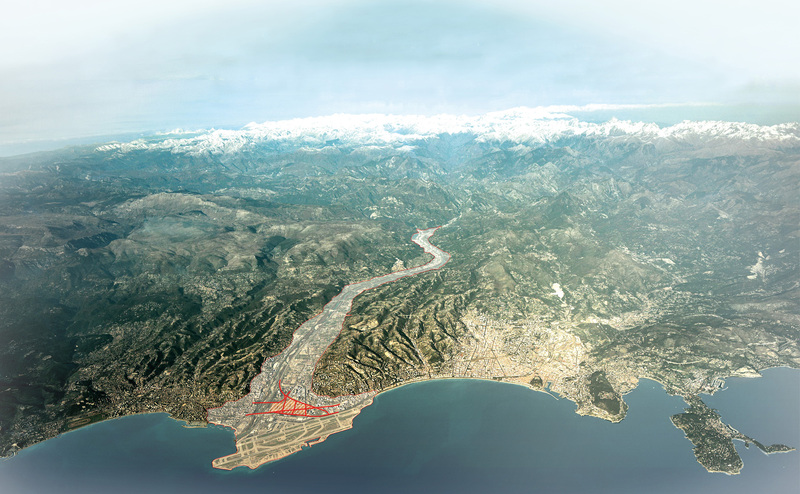 The abscissas, from east to west, parallel to the sea, correspond to the start of the Promenade des Anglais and the railway layout. 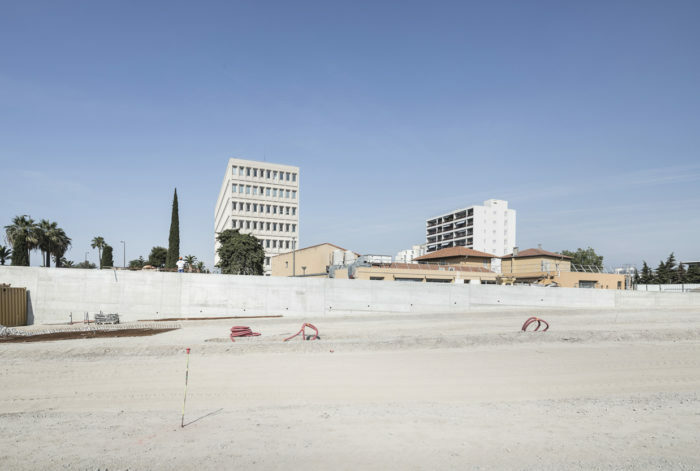 The lines across the plane generate a grid that marks out the structure of reference for the entire project, as a support for urban space and as a breakdown of the surface into areas on which construction will rest. The urban space is varied, organized around the classical street-plaza-park trilogy. The main streets follow the axes described, adopting different morphologies according to the conditions. Parks materialize contact with the limits, and plazas relate above all with the railway, as spaces leading to the station and as distance, protection. The built volume is arranged according to the principles of the dense Mediterranean city, with a basically traditional scheme of heights. At certain points, however, building rises to punctuate the space, mark limits and establish relations with modern growth to the north of our implantation. A study of the conditions based on sustainability—that is, the meeting with basic issues of nature—has been very useful to defining with precision the morphology and a degree of detail. Accordingly, problems of flooding generate the artificial topography at the basis of the whole, which we insist remain land, not the artificiality of the podium (a “No” to the urbanism of the concrete slab), and studies of natural lighting (summer/winter) and ventilation (prevailing winds) played a vital role in deciding the position and interaction of the volumes. Design work on this ambitious project started in 2011 and now (2017), with the construction of the axis that is the multimodal hub, the arrival of the tram and the first buildings, it is starting to be a reality. 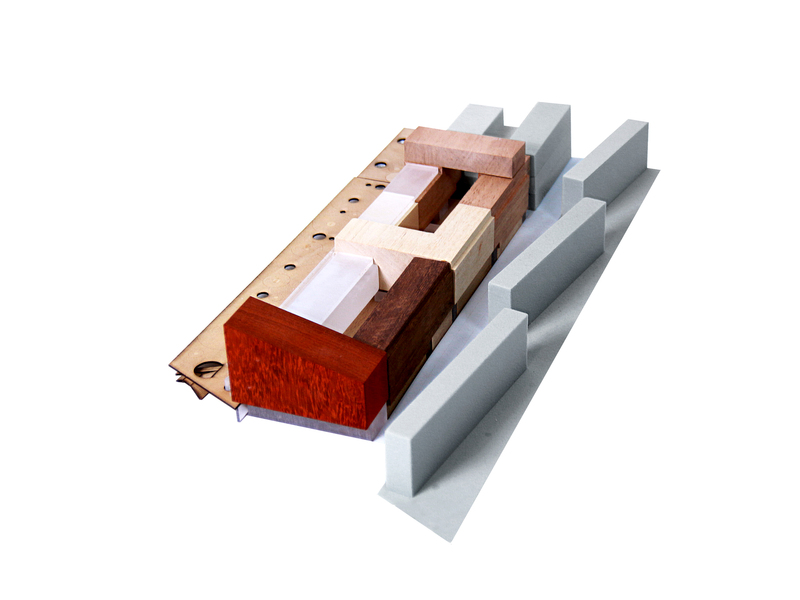 Our project sets out to construct an urban form that consolidates the northern part of the multimodal axis. Currently located in empty space, on the outer periphery, a new part of the city is set to appear here in the near future. A city at the intersection of new communication flows that will guarantee its centrality and prevent it being marginal (train, bus, tram, airport). Our building constructs a dense figure, with abundant new uses, an example of the mix required by the contemporary city (housing, offices, hotels, residential homes). 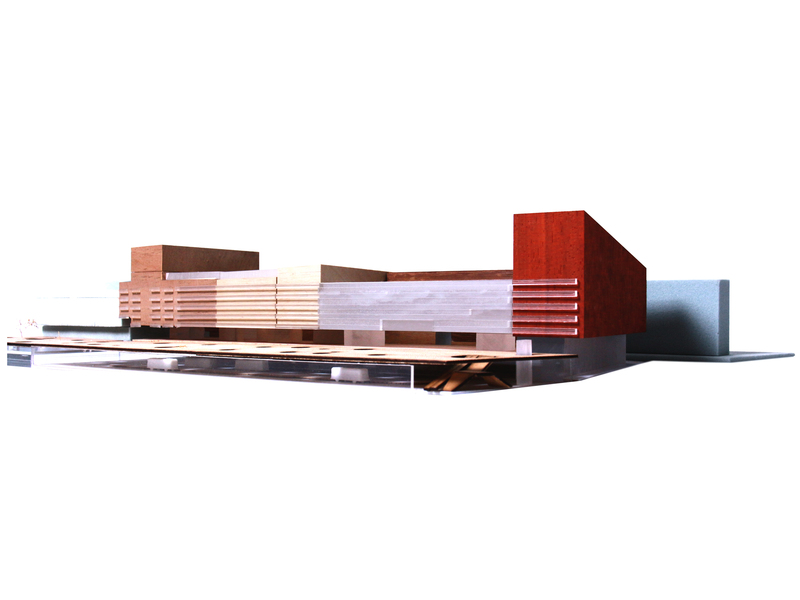 Our building constructs a horizontal figure, traditional in scale, punctuated by emerging points that relate it with its surroundings and complete the figure. Our building is hard, regular and repetitive— like much of our Mediterranean urban tradition. Our building relates with nature: with sun, light, wind … its inner courtyards are the typical microclimates of our culture. Our project aspires to bring together a vision at the urban scale and a local meeting with matter. Detail will also play a leading role.